TOUCHDOWN - Manvel's Ladarius Owens (21) dives over the goal line to help lead the Mavericks to a 62-42 win over Barbers Hill in the Class 5A Region III Div. II bi-district round. Owens had 15 carries for 122 yards rushing and three scores while grabbing three passes for 81 yards and two more scores. 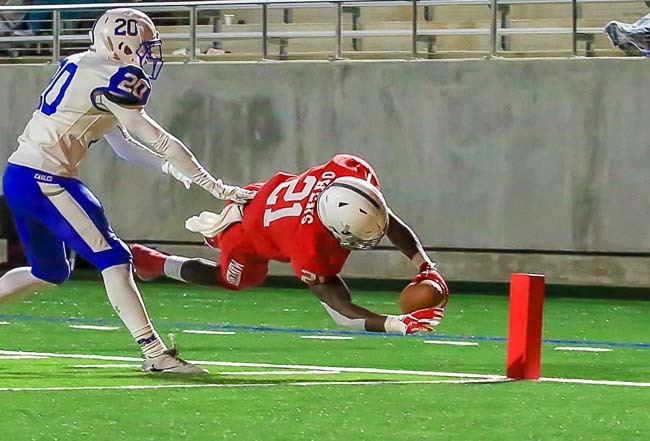 MANVEL — The final score between Manvel and Barbers Hill was not a true indication of the game that was played. Barbers Hill surprised the Mavs with a second-half onside kick they recovered at the Manvel 46. 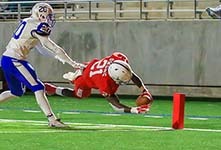 However, Manvel's Trevion Robertson stepped in front of an Eagle receiver for the first interception. Manvel's Ladarius Owens was the star of the drive as he ripped off a big run of 20 yards to the Eagles 28. A couple of plays later, QB Josh Coltrin tossed a short pass to Owens who skipped into the end zone for an 11-yard touchdown and a 42-28 lead. Manvel (9-2) moves on to the Class 5A Div. II Region III area round and will face Huntsville on Friday, November 23 at NRG Stadium at 12:00 noon.